In the beginning of 2018, the world witnessed a major Facebook algorithm change. 6 months later, social media marketers were surprised with yet another blow! Facebook cancelled many of its privacy-breaching, consumer targeting options and considerably reduced the marketers’ ability to target ads to specific users. In order to overcome and compensate for such challenges, creative advertising agencies have discovered new avenues to monetise on. 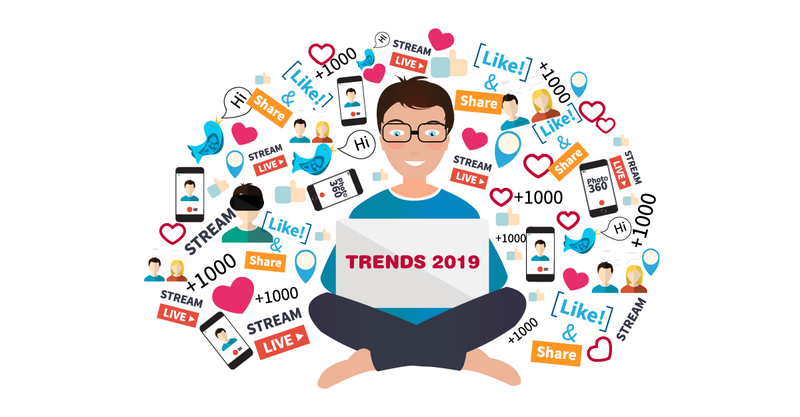 Here are a few social media platforms that are worth going gaga over in 2019! A social media platform with no advertisements? Yes, it is possible. On Vero, one can share books, movies, music, links, and locations and also customise who they want to share it with. But how will a ‘no advertisements’ platform help marketers? Vero can be used as a research tool for insight mining that uncovers the true inspiration of a broader consumer base. With Vine’s concept of short videos and Snapchat-like interface, TikTok has amassed quite a following worldwide. It allows its users to create 15 second long musicals where they dance, act, and lip-sync. Speak the language of millennials with TikTok! Millennials use TikTok on a daily basis, either out of habit or for a quick laugh. With influencer marketing, branding agencies can simply hire top influencers on TikTok to market their products through creative short videos. We spend a lot of our precious time on social media and it is about time we made money out of it! Stemmed from this concept, Steemit is gaining a lot of steam lately. It pays its users ‘Steem’ crypto-currency every time they post or share anything. And yes, these tokens have real market value! Use Steemit for Content Marketing! Steemit could become another content marketing channel for marketers which will also provide a good ROI in form of Steem crypto-currency.